(September 01, Chennai, Sri Lanka Guardian) Pakistan’s President Asif Ali Zardari has been in Urumqi, the capital of the Chinese-controlled Xinjiang province, with a high-power ministerial and official delegation since August 30,2011. He has gone to Urumqi to attend the inauguration of the China-Eurasia Expo being held there from September 1 to 5. This is Zardari’s seventh visit to China since taking over as the President in 2008 to study the economic development of different regions of China. 2. Miss Bakhtawar Bhutto Zardari and Miss Aseefa Bhutto Zardari are also accompanying the President. Bilawal Bhutto, Zardari’s son, who is the President of the Pakistan People’s Party (PPP), is separately travelling to China later this week to attend an international political conference. It is doubtful whether the Chinese would similarly welcome and accept the inclusion of any leader or official of the Government of J&K in an official delegation from India. 3. Among others accompanying him are Foreign Minister Ms. Hina Rabbani Khar, Commerce Minister Makhdoom Amin Fahim, Defence Minister Ch. Ahmed Mukhtar, Petroleum and Natural Resources Minister Dr. Asim Hussain, Chief Minister Gilgit-Baltistan Syed Mehdi Shah, Prime Minister of Pakistan-Occupied Kashmir (POK) Chaudhary Abdul Majeed, Chairman Board of Investment Salim H. Manviwala, President of the Federation of Pakistan Chambers of Commerce and Industry (FPCCI) Senator Haji Ghulam Ali and spokesperson to the President Farhatullah Babar. 4.This is the second time the Chief Minister of Gilgit-Baltistan has accompanied Zardari on one of his China visits. Syed Mehdi Shah had accompanied Zardari to Guangdong in China to attend the inaugural function of the 16th Asian Games at Guangzhou in November last year. He was extended VIP treatment by the Chinese authorities on par with the other members of the Pakistani delegation. 5. Mehdi Shah was invited for a welcome banquet hosted by State Councillor Madam Liu Yangdong for the foreign dignitaries, who had come to participate in the inaugural ceremony of the Asian Games. He was also a member of the Pakistani delegation headed by Zardari which held bilateral talks on Sino-Pakistani relations on November 12, 2010, with a Chinese delegation headed by Prime Minister Wen Jiabao. 6. While briefing Pakistani media personnel on Zardari’s talks with Chinese Vice-Premier Li Kequang on August 31, Farhatullah Babar claimed that Vice-Premier Li made a special mention of the inclusion of the Chief Minister of GB in Zardari’s delegation and described it as a gesture. 7.The lack of any Chinese reservation over the inclusion of the heads of Government of the POK and GB in Zardari’s delegation and over their participation as members of the Pakistani delegation in the talks with the Chinese delegation underlines once again that the Chinese no longer consider the POK and the GB as disputed territory whereas they continue to look upon Jammu & Kashmir as a disputed territory. 8. It is doubtful whether the Chinese would similarly welcome and accept the inclusion of any leader or official of the Government of J&K in an official delegation from India. 9.During the three days that Zardari has spent in Urumqi before the inauguration of the Expo, he has had three levels of talks. The first was with a delegation of leaders and officials of the Xinjiang provincial Government and Communist Party headed by the Secretary of the Communist Party of China (CPC) Xinjiang, Zhang Chunxian. The second was with a delegation from Beijing headed by Vice-Premier LI. The third was with a delegation of heads of Chinese companies assisting Pakistan in various infrastructure projects. ( a). Continuing Sino-Pak co-operation in counter-terrorism in general and in dealing with the activities of Uighur dissident/ terrorist elements operating from Pakistani territory. 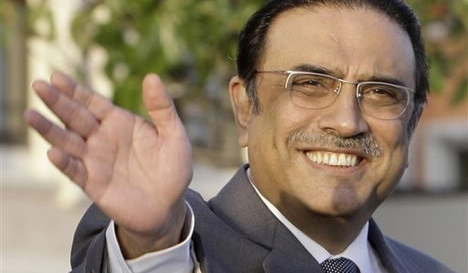 While assuring the Chinese authorities from Beijing as well as Xinjiang of continued Pakistani co-operation in this regard, Zardari was also reported to have thanked China for standing by Pakistan during the controversy with the US regarding the sincerity of Pakistan’s counter-terrorism track record after the death of Osama bin Laden in a US commando raid at OBL’s hide-out at Abbottabad on May 2. ( b) .Sino-Pak strategic relations: Zardari reportedly described China as Pakistan’s life-line. He told the Xinjiang delegation: “We offer our territory and ports for Chinese trade.” He was quoted as having told Vice-Premier Li that the two countries needed to expand existing maritime cooperation into a more comprehensive strategic maritime partnership. There was no clarification forthcoming from the Pakistani delegation as to what Zardari meant by this. Was he referring to more structured co-operation against piracy, which might involve Pakistani ports being used regularly by Chinese ships on anti-piracy patrols or was it a reference to Pakistan’s need for Chinese naval assistance in the wake of the gaps revealed by the success of some terrorists in attacking the headquarters of the Pakistan Naval Air wing (PNS Mehran) at Karachi in May? There was also a discussion on possible Sino-Pak co-operation in helping Afghanistan in the field of economic development. ( c ). Chinese assistance for infrastructure development projects in GB. In this connection, reference was made to three on-going projects for repairs to and upgradation of the Karakoram Highway (KKH), the construction of the 4500 MW Diamer Bhasha Dam and the 7000 MW Bunji Dam and the construction of a dry port at Sost on the KKH by SinTrans, a Chinese construction company, which has an equity stake in it. It was stated by Pakistani officials that the Government of Pakistan has accepted a proposal of the China Reconstruction Bridge Corporation (CRBC) for the construction of 13 kms of new route and rehabilitation of 22 kilometers of existing sections of KKH by lowering the water level in the lakes in the region. ( d ).A review of Chinese assistance for infrastructure development in the rest of Pakistan. The focus was on Chinese assistance for the development of mineral resources, for the expansion of Pakistan’s power production and transmission capacity and the construction of a new city in Sindh to be called Zulfiquarabad. There has been no reference to possible Chinese assistance for the construction of a railway line from Xinjiang. 11.Pakistan’s total trade with China is estimated at US $ 8.7 billion. Out of this, its trade with the Xinjiang province is estimated at about US $ 400 million only.